The incentive schemes are mainly applicable to individual workers. But a good bonus scheme is for those groups of people who have been working together for a long time.Such types of bonus schemes may be called a group bonus schemes. It may only be applicable in some places and cases. Like all other approaches, bonus schemes advantages and disadvantages and have been discussed properly in the article below. Keep reading to find out more below. What Should you know about Group Bonus Schemes? In a group bonus scheme, it is very important to have team work first of all. Second, you are required to reward not just those who are working directly but also those who are working indirectly and ones who can help other workers. It may be hard to see the whole output of people individually since it all depends on the efforts that are put in by the group itself. When you have a group bonus, it will be divided among the people who are working in the group in proportion to the usual wages that are earned by them. Where can a Group Bonus Scheme be Implemented? A group bonus scheme is usually desirable to those who wish to create some good team spirit first and foremost. Secondly, it may not be possible to check out the production of such individual workers. Third, it is needed to reward the indirect and direct workers. It may not be entirely possible to check the production of people who are working individually. The output also tends to depend on the efforts put in the team. What are the Features of Group Bonus Schemes? Group bonus schemes are very much payable so that there is efficiency among the team of people who are working. The bonus shall be paid as a joint effort of the whole team itself and the target must be fixed. The bonus to employees will also be given individually based on a percentage basis that is pre determined. The scheme or the objective of the team spirit will depend on the production that is increased and lowered depending on the unit. 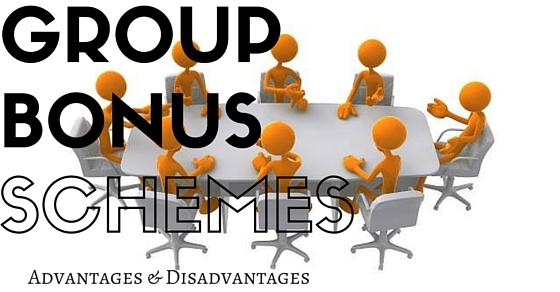 In this section, you are going to learn about the various plus points of group bonus schemes! One of the biggest advantages of group bonus schemes is that it helps in creating team spirit which can in return give you a much bigger output. It also helps in creating a better environment to work in and makes sure there is harmony among colleagues. Group bonus schemes also make people feel united. Bonuses improves relationships as well. You should definitely have group bonus scheme at your workplace if you haven’t. Group bonus schemes also help you save up time. This is because people who are working in the group will divide all the work among themselves depending on the convenience which keeps in the view the whole interest of your group as a whole. A great reason why you should have group bonus schemes is because it will guarantee timely wages to people who are working inside the group. Nobody will ever end up missing out on the wages. At least that will be guaranteed to you. Most workers will probably maintain the flow of production inside every group. In that case, a group bonus plan can turn out very useful when it comes to activities where there are several processes that are involved. The whole finishing of the process will depend on the completion of the whole process. Those who work as support workers who are not associated directly with the methods of production can be added to the group bonus method quite easily since the whole point of having this scheme is so that it can be divided among most members of the whole group which is in proportion to the basic wages that are earned by all of them. Group bonus schemes will also reduce the rates which are needed for negotiation. In that way, you can actually save up a lot and keep all members of your workplace happy and satisfied without any sort of hassle. Finally, group bonus schemes are very easy to manage. This is because most of the members of the group will be able to take better care of themselves. It will become much simpler since less recording of the labour times as well as production rates shall be needed. The sad part about having group bonus schemes is that everyone gets the same share. So if you have worked better than someone else, then you won’t be recognized for it most probably. You will be getting the normal time earnings and make the same kind of cash as well. So even if you have worked very hard, be prepared to get recognition whatsoever. The other thing about group bonus schemes is that they aren’t very direct in terms of approach so it will not be able to provide you the same kind of incentive as the individual incentive schemes provide usually. Another possible disadvantage is that it will be hard to get an agreement on the proportions of the bonus that all the members of the group will get. Therefore it could be difficult in the distribution of the bonuses among members. This brings the post to an end. If you have enjoyed reading this article and found some benefit from it, do let us know in the comment box below. We would love to hear from you. Also, remember that group bonus schemes like every other scheme has its own share of advantages and disadvantages. You have to discuss the matter with your entire team before any serious step is taken. On that note, good luck and here’s hoping that you have liked reading the article. Do let us know your questions if you have, in the comment box below.